According to him, Ghana Water Company Limited respects the right to safe and clean drinking water as a human right, which is essential for the full enjoyment of life and all human rights. "The human right to water entitles everyone, without discrimination, to safe, acceptable, physically accessible and affordable water for personal and domestic use. As humans, about 99% of our livelihoods depend on water, unfortunately, 80% of our urban population have access to water supply. It is, therefore, our responsibility as the sole urban water supplier to ensure that, 100% of urban dwellers get access to safe water’’, the Director assured. He further indicated that several interventions have been undertaken to reverse the decline in the water supply. "The Kpong Water Supply Expansion project (Phase 1) is one of such interventions undertaken to improve water supply to the Greater Accra Metropolitan Area. Phase 2 of this project will soon commence as the Government and the Ghana Water Company Limited are nearing conclusion on the processes, and we are optimistic that this intervention will further improve the water coverage in the Greater Accra Metropolitan Area,’’ The Managing Director added. Dr. Clifford Braimah continued that the company has over the last few years commissioned the ATMA Rural Water Supply Project, Kpong Intake Supply, Teshie Desalination Plant project to increase production under the GAMA sanitation and water project. ‘’This project is also aimed at increasing access to water supply in the Greater Accra and some communities in the eastern and Volta regions. 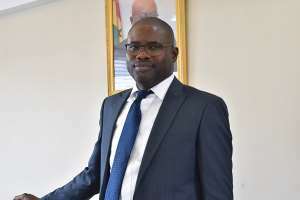 ‘’ There is also an on-going construction of storage reservoirs and standpipes, as well as the establishment of a Telemetry system for the Greater Accra Metropolitan Area. There is also a plan to develop a new water supply system to the Esiama enclave including communities located along the coast between Esiama and Half-Assini, in the Western Region. These and other key on-going and planned programs will help improve the water supply coverage to ensure clean and safe water for all,’’ Dr. Clifford Braimah further explained. ‘’Water pollution touches everyone’s life in many ways. Pollution of our rivers and water bodies have had a negative impact on the operations of GWCL and this is primarily because of the high level of pollution on these rivers and water bodies from which GWCL abstracts raw water for treatment‘’. The water bodies in Ghana are polluted through alluvial mining, settlement, and farming activities along the banks of these water bodies, the discharge of industrial effluent, Sand winning, and Aquaculture. Generally, the state of the raw water in Ghana is poor. The raw water quality keeps deteriorating, affecting not only the water resources but also the economy of the country. Thus, we experience inadequate and irregular drinking water suppliers, a threat to public health, a threat to national development and a threat to the achievement of the SDGs. There is also a threat to Food and Energy security, Nature (Ecosystem and biodiversity), Poor Livelihood choices and educational opportunities’’, Dr. Clifford Braimah observed. ‘’I am inspired by your determination to ensure that all marginalized groups get access to safe water. I believe that to leave no one behind, we must protect our water bodies with our lives, get rid of habits that render our water sources unsafe. By keeping our water sources clean, there would be enough freshwater to meet the needs of the marginalized groups, hence ensuring water for all by 2030’’, Dr. Clifford Braimah concluded.